BEAST IN BLACK Reveal New Album "From Hell With Love"
Less than one year since the release of their enormously successful debut album Berserker, up and coming metallers BEAST IN BLACK are currently putting the finishing touches to their highly-anticipated sophomore record in guitarist Anton Kabanen's home studio. But before their fans can listen to the group's new tunes, the band are ready to reveal the title of the album, which will see the light of day on February 8, 2019 through Nuclear Blast - just before their very first, recently announced EU headline tour with Finnish electronic crossover band TURMION KÄTILÖT kicks off! Comments the band, "Sometimes it felt like hell working so much and so hard on the second BEAST IN BLACK album, but we put our hearts fully into it. Well, this is for you guys, From Hell With Love!" More details will be revealed soon, stay tuned! 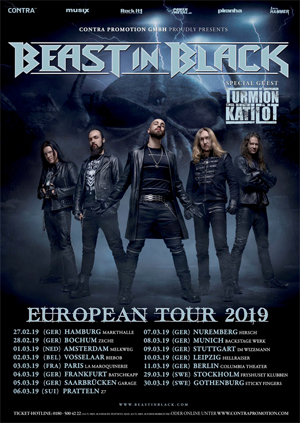 Be sure to check out the trailer for BEAST IN BLACK's 2019 headline tour below.